You'd think the saying "If at first you don't succeed, try, try again" would be perfect for rugby as it has a game-related pun baked right in, but should it really apply in practice, especially when you're facing the All Blacks? You’re playing on the left wing, your team is ahead 9-6 against the World Champions, the ball comes to you and there's a gap in behind the opponent facing you, so the decision is to chip one over him to get into that space. The only problem with this plan is that the opponent in question is none other than the massively experienced, massively talented and massively massive All Black skipper Kieran Read, and he is not only able to block your chip but it falls nicely for him and all he has to do is gather and run in his team's first try of the night. But then the almighty rugby gods do you a favour, possibly on account of all the hard work you and your team have put in up to this point (although their actions are rarely based on merit). Read somehow can't hold on to the ball and the result is a scrum to your team and a chance to clear. The reprieve brings a sense of relief that is felt all over the Aviva Stadium. Now fast forward a few minutes. We were in another pickle of sorts in our own half only this time Peter O’Mahony, having yet another ‘game of his life’ to add to his collection, has just jackled us out of it and we now have an attacking lineout where the called move is one where the ball is coming back to you on the wing. The set-piece works perfectly - lineout won (phew), your half backs fool the opposition that the ball is going out to the right wing only they switch it back so that when you receive it, you have a similar situation to the one before - space beyond the opponent, although this time it's further up the pitch. And just to make things a little more challenging, it's not a big All Black bearing down on you this time… It's TWO big All Blacks in the shape of both locks Brodie Retallick and Sam Whitelock. There's one factor missing from the above scenario. I have laid it out as if it is meant to involve just any rugby player. When you add the element that we're talking about one who has been coached by Joe Schmidt, the decision-making process alters dramatically. He has a system for pretty much every situation you can find yourself in on a rugby pitch, and in this one, you are to go for the space. And by handing you a starting jersey again and again through the team's most successful period ever, he has backed you to implement that system. So you return that favour by backing yourself not to make the same mistake twice and you chip it ahead anyway. Then the rugby gods stay with you some more bringing the bounce back into your possession, but from there it's all you. Pace. Power. Precision. Over the line. Try Jacob Stockdale. Try Ireland. Over 50 thousand fans go mad in the stadium while millions around the world do likewise. And that is pretty much how the whole match went for Ireland. No, not everything went perfectly. We did some of the things we assumed we could never ever do against the Kiwis. Some box kicks were going too far. Some lineouts were lost. Some needless penalties were shipped. Some questionable tactical decisions were made. And although referee Wayne Barnes had a great night himself overall, there were a few calls and non-calls that went against us. When you add all of that together, you could never see it leading to this result. Yet it did. 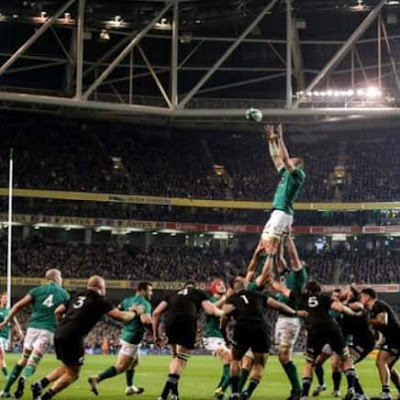 And for me the best illustration that our display got to the All Blacks can be shown by this picture. Whether Kieran Read led his side out early for the second half or Rory Best was late we will probably never know, but as you can see, Read was all smiles while he waited and his team mates were equally jovial. This is nothing more than a ‘hot take’ from me but I reckon that display of high spirits was by design to show they weren't rattled when all the evidence from the first half suggested otherwise. And it wasn't simply a result of our display either - the game was nary a minute old when the All Blacks, on their very first possession, chose to kick the ball rather than face our Andy Farrell-coached cordon of tacklers, and this was the offensive policy du jour for them all the way up to Stockdale's try. When you think about it, that's a stunning decision for them to make if true. Sure, we've made a name for ourselves over the years for being very tough to beat, but these are the bloody All Blacks! Even missing players the calibre of Sonny Bill they should surely back themselves to wear us down yet the boot went to ball again and again and again, and let's not forget that we had a certain Mr Robert Kearney patrolling our backfield. So one by one in the first half, bouts of All Black possession would amount to nothing. When they kicked, we'd handle it. And if we got to them before they kicked, we'd be able to jar it free or force a knock on. All they got to trouble the scorers in that time was one penalty and one drop goal from Beauden Barrett (they wouldn't even go for a try on a so_called ‘free play’), a first half return they must surely find unthinkable. Meanwhile we were making decent progress with the ball ourselves, and in general the attacking patterns were ones we have used many times before yet are still difficult to stop when done accurately. The only move I noticed that looked like something tailored for this particular match was the switch play that led to the try, and it earlier helped get us our first three points of the night. And we were being brave in our decisions at times, another thing Read & co wouldn't be used to. Kickable penalties were being sent instead to the corner for lineouts, a set piece where we have had issues of late. We even had a nudge in the scrum, and while can't believe I'm saying this, I thought we didn't back ourselves enough to force home the clear advantage Tadhg Furlong enjoyed over his opposite number Karl Tuinukuafe. I thought an extra scrum could have been taken for a penalty under the posts, especially right after Kearney's almost-try, but then again an easy three points against the number one ranked team on the planet is hard to resist. Often for big matches referees seem to decide that you'll have to produce an actual weapon to receive a card, and it looked like Wayne Barnes was doing that here. Because even if the sheer volume of pings don't tempt the card from the pocket, some infringements should do so all on their own, like a deliberate knock on from Whitelock that was far more blatant than one that had earned Willie le Roux time on the naughty step in Murrayfield earlier in the day. Yet despite the lack of yellow card, and despite the few errors, we remained on top all the way up to the try, which Sexton also converted to give us a ten point lead, a two score margin we had been denied in the closing stages back in 2013. Which meant now the task was simple, add to the lead if we can, but at very least bring the win home. And nobody was under any doubt that they were going to respond; on normal days for them, a deficit like this can be turned the other way in a matter of minutes. From the kickoff following the try, they seemed to abandon the high kicking plan and opted instead to run and offload their way through us. And it very nearly worked too, but for a bit of good fortune and a lot of Peter O'Mahony. He'll carry. He'll clear out. He'll force a turnover. He'll pinch a lineout. And most of all, whether he's captain or not, he'll both lead by example and stick up for his side with the ref. He is as complete a player as you can have in this sport and has made himself undroppable. Just in case there are those who think as a Leinster fan I'm reluctantly hopping on an O'Mahony bandwagon after his man of the match performance, I wrote the above about him on these pages just before the November series began and I have been a fan of his for a long time. He just has that knack of being exactly where you need him to be and able to do exactly what you need him to do, and they aren't always jobs that his jersey number is meant for either. Several times at rucks both Kieran Marmion and Luke McGrath hurried to get the ball away so much that they had to scoop the pass and did very well each time, yet not to be outdone, POM managed one of those himself. And earlier it seemed he wouldn't last as long as he did when he was being treated for what turned out to be a dead leg but he soldiered on and it's just as well he did because he made arguably the game's biggest contribution of all on 60 minutes. The All Blacks with their 'new' approach were actually beginning to stretch our defence and it seemed like they were aiming to get it in behind us on the left flank. The first little grubber there was tidied up by Stockdale but the second looked to all intents and purposes like it was going to Ben Smith who would have had an easy route to the try line. Yet POM had other ideas. I have watched it about a dozen times and it's like he knows even before he turns around what he's going to do. Getting back to make a tackle wouldn't have been enough. The only option was to grab the ball for himself and he made it look like it was all happening in slow motion for him. What a wonder play. And he probably wouldn't let me heap too much praise on him without mentioning his team-mates; first they had to back him up to help tidy that particular situation but after he threw in another jackled penalty for good measure minutes later, he was finally hauled ashore so the lads had about 20 minutes more to bring this amazing scoreline home. Boy, did that time drag on. And on. Phase after phase after phase that seemed like minutes had passed yet they were but mere seconds. A Sexton high tackle (our defensive style always runs the risk of these calls and in fairness we were only pinged 5 times on the night) allowed Barrett to get them within seven to set up a grandstand finish most will have expected. We had survived a long spell when we struggled to get out of their half and the gradual introduction of the bench to the action made no difference to the overall systems, with even the odd mistake like some lost lineouts not costing us too much. So with the clock reading 78:48, we have the ball just inside our own half, and Luke McGrath sets himself to box kick, amid much consternation from some Irish fans. But I wasn't one of them. The way I see it is that when you're defending a lead and you're faced with a decision late in a game, you should always trust your defence, particularly ours. I remember when the Welsh got within a score of us back in the Six Nations there was a temptation for us to win back the restart yet we put it long and ended up nicking an extra try from it. I know this was better opposition, but having kept them tryless up to that point, I thoroughly back McGrath's decision. Now maybe my heart beat a little quicker after each of the 18 phases that followed, especially as they managed to advance the ball all the way to our 22 in that time, but eventually Retallick got a pass he couldn't handle and that was that. We've only gone and beaten them again lads, and on home soil this time! And it was thoroughly deserved. The result of excellent preparation, execution and at times, innovation. The thing I liked most about our approach is that it looked like the game plan didn't really change because of key players that were missing. Van der Flier did a superb job for Dan Leavy. Bundee Aki was called on for crash ball every bit as much as Robbie Henshaw would have, and what's more, he worked well with Ringrose to keep the defensive centre channel intact. And arguably the biggest shoes to fill were those of Conor Murray; between them Kieran Marmion and Luke McGrath did extremely well all things considered. Then there was Devin Toner and James Ryan, comfortably the best two locks on the pitch throughout which is no mean feat given who they were up against. As for Johnny Sexton, pretty much all of the above couldn't take place without flowing through him. Simply put, he had the better plan and made it work. Hopefully his withdrawal before the end wasn't for anything too serious. What I generally do with these writeups is try to harp on the 80 minutes of a particular match, and up to this point hopefully I have done so. But this one was about more than what happened on the pitch. Now we know that we're more than a match for any other test team in the world on our day. Nothing is certain for us in the World Cup, and it isn't even certain when we defend our Grand Slam. But one thing is definitely certain...whatever about the overall rankings, Ireland has been the top test team in the world in the calendar year of 2018. Later this week we'll have a guest post from Keego plus our 80-word reviews on Tuesday, Harpin Points on Wednesday, Telly post on Thursday and our Leinster v Ospreys & Ireland v USA previews on Friday. Plus of course every morning our Front5 quotes & links. Do stay tuned!